Well-appointed Single room for 1 person. Free Breakfast and airport shuttle (to and from the airport) included in room price. 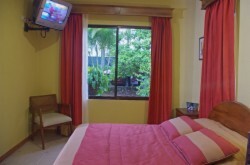 Amenities Include: Private Bathroom, Hot Water, A/C, Cable TV, Terrace/ Balcony, and Garden View. 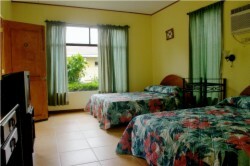 Spacious Double room for 2 people, with room for 4. Free Breakfast and airport shuttle (to and from the airport) included in room price. The Superior Rooms are more spacious and quieter than the standard rooms, they are located near the garden with great views. Free Breakfast and airport shuttle (to and from the airport) included in room price. 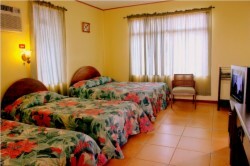 Amenities Include: Private bathroom with hot water, A/C, Cable TV, Private Balcony, Garden View and Free Wi-Fi. Well-appoint with beautiful decor our Family room is very spacious for 2 people, with room for 4. Free Breakfast and airport shuttle (to and from the airport) included in room price.